New York: Robert O. Ballou, 1933. First Edition. 8vo; 251pp, with 75 photographs on double-sided plates, including frontispiece; original blue cloth, gilt spine, edges faded about 1/8 in, endpapers a bit aged toned, jacket chipped along all edges rubbed ("E" in Peterkin missing on spine) with creases on both front panel, very good in used jacket. Julia Mood Peterkin (1880-1961), South Carolina native, lived on her husband's two-thousand acre plantation and also had a summer home at Murrell's Inlet, a coastal village. She wrote, with realism and dignity, plantation stories and stories of the Gullah African American tenant farmers of the Sea Islands and coastal regions. She was a sympathetic and outstanding commentator of the lives of this vanishing black culture. Doris Ulmann (1882-1934) was a well-respected photographer of the period who specialized in portraying the people of the "Southern Highlands" Appalachia and the coastal blacks Peterkin wrote about. Ulman's photographs of now vanished worlds capture her subjects with respect, insight, and grace and a transcendent quality which embodies the beauty and mystery of human experience. 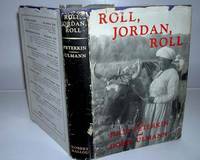 ROLL, JORDAN ROLL is a non-fiction work which portrays the Gullah in a perfect artistic blend of text and picture. American Woman Writers III, pp. 373-374. Jacobs, The Life and Photography of Doris Ulmann. In Focus: Doris Ulmann, Photographs from the J. Paul Getty Museum. New York: Robert O. Ballou,, 1933. Octavo. Original blue cloth, titles to spine gilt, top edge black, others untrimmed. With the photographic dust jacket. Frontispiece and 70 full-page photographic illustrations by Ulmann. Spine rolled, light foxing to endpapers; an excellent copy in the jacket with foxing to edges and rear panel, small chips to spine ends and fold of front flap, small closed tear to head of front panel. First edition, first printing, trade issue. Preceded by a deluxe limited issue of 350 copies signed by the author and photographer, printed on large paper and specially bound with 90 images. Uncommon in the jacket. Named after the spiritual written by Charles Wesley this collaboration by Ullmann and Peterkin focuses on the lives of second- and third-generation "free blacks" in the Gullah region of South Carolina. "Peterkin, a popular novelist who won the Pulitzer Prize in 1929, was born in South Carolina and raised by a black nursemaid who taught her the Gullah dialect before she learned standard English. She married the heir to Lang Syne, one of the state's richest plantations, which became the setting for Roll, Jordan, Roll" (Roth, 101 Books). Peterkin was at the time applauded for her telling of the accounts which accompanied Ulman's portraits, despite their paternalistic tone.